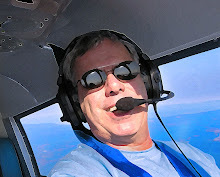 Since beginning World of Flying in December of 2005, I have written many times about the responsibility each of us aviators have to reach out to the public and tell them about this incredibly cool thing we enjoy called flying. 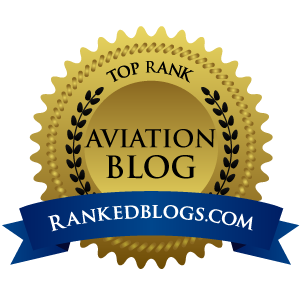 We all need to be spokespeople for general aviation, and we need to keep a lookout for opportunities to blab our story to the masses. Mutual of Omaha has been running a campaign that is based around the "Aha moments" of regular people. They outfitted an Airstream trailer with a mobile TV studio, and hit the road in search of stories. The Aha Traveling Road Show was slated to visit Eugene, Oregon, so their researchers began looking for interesting people in my city with a story to tell. After one researcher stumbled on this blog and liked what she saw, they shot me an invite to come tell the world my aha moment. It was the opening I was waiting for. Aha moments are powerful. More than an idea, or an epiphany, aha moments demand attention and action. Deciding on a new career. Jumping out of an airplane. Launching an international philanthropy, or becoming a fire dancer. In 2004, researchers at Northwestern University wanted to discover the physiological responses that lead to the breakthrough moments known as aha moments. What they discovered was that a split — second before having an aha moment, we experience a burst of electrical brain activity... kind of like a big light bulb going off in your brain. They have been described as, "magic," "enlightenment," and, "that moment of clarity when all the pieces fall into place." 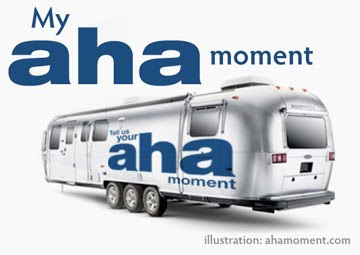 They've told us that having an aha moment is like, "getting hit by a bus," and that it just "hits you." What is an aha moment? It's a moment of clarity, a defining moment where you gain real wisdom - wisdom you can use to change your life. Whether big or small, funny or sad, they can be surprising and inspiring. Each one is unique, deeply personal, and we think, worth sharing. Mutual of Omaha celebrates and honors these moments and the people who act upon them. We're proud to have the products and services that can help people insure their possibilities. My aha moment came in 1991 while looking at my late father's logbook. Louie "Papa Louie" Pimentel had 25.1 hours logged when he was hit with a massive stroke that year and passed away suddenly. He had yet to solo, but I remember him telling me how happy he was to finally be starting flight training. He had fallen in love with flying while listening to the family Zenith All-Band console radio in the early 1940s, mesmerized with DC-3s as they operated out of San Francisco. AOPA members can read the entire saga of Papa Louie, The Old Radio and Flying from the October, 1998 AOPA Pilot Magazine by clicking here. Anyone reading this who has lost a parent they loved and admired knows the waves of emotion that hits you in those few days after their passing. I was given the three things most important to Papa Louie right after his funeral, an Icon handheld aviation radio that was welded to his hand while he was training, a well-worn pair of Birkenstocks (that incidentally fit me perfectly, kinda spooky) and his logbook. When I opened the book and saw the last entry, I broke down big time. It was just a short hop from Fresno Airport (KFAT) across town to Chandler Airport (KFCH) in a C-152, N25829, four landings and 1.0 on the Hobbs. But it represented the end, for him, and I knew it was the beginning for me. I went home and stared at his logbook for hours. And the very next day, I called up a CFI I knew and told him I was ready, that day, let's do it. What my aha moment taught me – and what this post is intending to teach you – is that life is shorter than you think. I started flying that week, but life got in the way as it always seems to. It took me until 1996 to earn my ticket, but I kept the promise I silently had made to Papa Louie after we lost him, to get my license, for him. So if you are a licensed stick and are reading this, go out and convince a friend or family member to start those lessons tomorrow. Do it because they really will regret it if they've always dreamed of flying, but put it off for any of the many sorry excuses we use to avoid the left seat. And if you are not a licensed pilot and always wished you were, please think about Papa Louie's story and go do it today. Consider this your aha moment, from me to you.